Once called “wastewater,” growers, agriculture, industry, and municipalities are now recognizing the value of “reclaimed water.” There are a variety of methods for applying reclaimed water, including center pivot systems, travelers, and Solid Set. 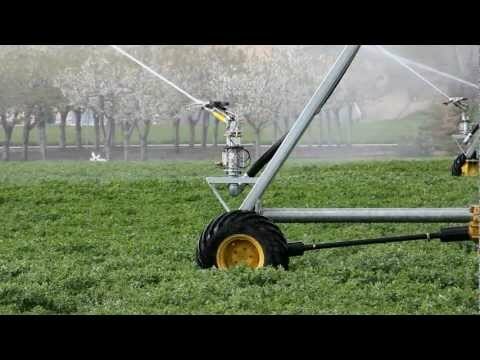 For gun irrigation, the Nelson Big Gun® is the sprinkler of choice. With a full range of models available, flow rates of 30-1200 GPM (6.8-275 m3/hr) can be achieved with maximum uniformity to match a variety of needs. Their large nozzle sizes reduce the level of waste treatment or filtration required, and their large throw diameters reduce the application rate. Pressure of at least 50 psi (3.5 bar) at the end of the system provides optimum gun performance, and low trajectory options can reduce susceptibility to drift and evaporation. The open architecture of the T3000 Trashbuster Pivot Sprinkler passes trash easily. Use it in conjunction with spray or Rotator plates and the 3000FC nozzle for pressure regulation. The O3000 Orbitor also is proven with reclaimed water, as its bracketless design prevents hang-ups.